This stallion has inherited his sire's elegant looks & famous temperament. He is a true Ridding horse stamp, full of quality & presence but given his Dam's achievements & family history also full of jumping ability. His elegant looks & paces have made him a top show horse & sucessful dressage horse but his ability over a fence & his breeding make him too good to just keep on the flat! He is by our one & only 'Country Top Gun' & as with his sire he is a true thoroughbred with pure quality, he is one of the most elegant coloured horses around & he is even more stunning in the flesh. His half brother 'Simbas Pride' is now on the Spanish Young Riders Show Jumping Team, he was sold as a 7 year old to Las Palmas, by which time he had substantial BSJA winnings. As both a 4 year old & 5 year old he was a WYEH Finalist at Burghley, as well as winning numerous Sports Horse Championships. Elite Graded for Dressage and Showing plus one of the top ridden coloured show horses in the UK.We believe he is the only coloured stallion to be Elite graded in both categoriesHis all round performance record is outstanding. 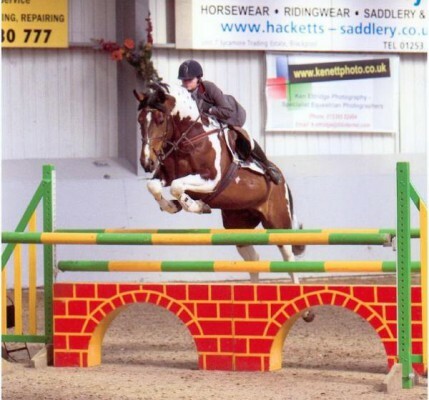 As a 4yr & 5yr old he qualified for the Potential Sports Horse Championships. Show JumpingAlthough he started off Show Jumping & was showing great promise with BSJA winnings & double clears to his credit, his dressage career has now taken over. He still competes between his showing & Dressage comitments & shows a huge bold jump everytime out. DressageHis dressage career is going from strength to strenght & the judges just seem to love him.He was Dressage Champion at CHAPS Championships 06 as well as Dressage Champion at the Festival of Champions 06. Affiliated he has over 200 BD points, with wins at Elementary & Medium. His laid back temperament & super paces make him a natural. He has been Dressage Champion at the CHAPS Championships a few years running, he has also won the potential Dressage Horse Class, the Performance Championshipand Combine Training Championship. He qualified both Summer Regional Finals & Winter Semi Finals ShowingHe is constantly improving in the Show Ring where his laid back temperament makes him reliable whatever the atmosphere, with impeccable manners & a lovely balanced ride he is rarely out of the top 3. 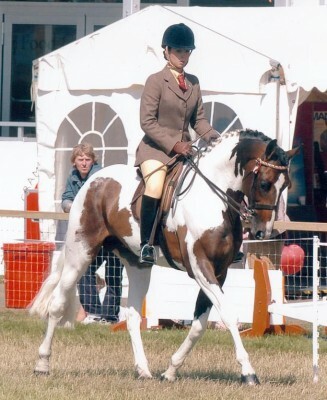 He has numerous RIHS & HOYS tickets as well as many Championships.To name but a few:- 3rd RIHS Ridden Coloured Championship 2006CHAPS Championship 07 he took 3 Championships, a Reserve, five 1st places & two 2nd places & gained the highest ride mark of the show 49/50 ! (see news page for full list)Reserve Lightweight Ridden Horse Champion CHAPS Championships 06 & 07Winner of The Greens Ridden Horse CHAPS Championships 06 & 07Performace Hosre Champion CHAPS 07Coloured Horse Champion Westmorland County 07CHAPS Championships 07 Central Prefx Award winner for the horse with most points gained through placings over the 3 day show.5th Ridden Coloured Championship 2008 RIHS2008 Coloured Ridden Horse Winner :- Royal Lancashire, Cheshire County, Staffordshire County, Westmorland County, Cartmel & 2nd at Royal Highland.CHAPS Championships 2008 Open Dressage Champion, Performace Horse Champion & Reserve Combine Training Champion2009 Coloured Ridden Horse Winner Royal Lancs, Cheshire County & Denbigh & FlintCHAPS 2009 Performance Champion, reserve Ridden Champion & Reserve Combine Training ChampionHOYS 2010 placed 10th ( 2nd highest placed Riding Horse Type) .